Starbucks has finally hopped on the iced green tea bandwagon with the introduction of three new chilled drinks that yours truly (with a small posse) had the pleasure of recently sampling. 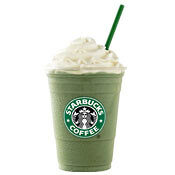 We had the green tea frappuccino (nice, but a weird aftertaste thanks to the melon syrup—it bugged me, but not my two other “tasters”), the shaken green iced tea and the shaken green tea lemonade—both unanimous winners, and both available unsweetened (with zero fat and 80 and 120 calories, respectively). $1.40-$4.20 (depending on location) at Starbucks, starbucks.com.